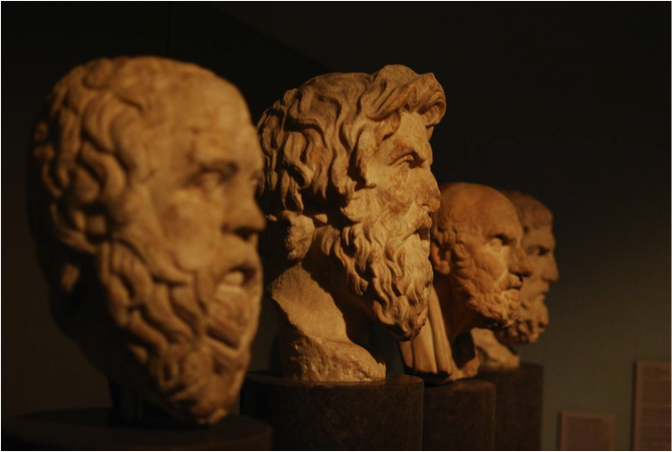 Are you thinking along the likes of the most famous Ancient Greeks, without even realizing it? Brushing your teeth in an early morning mental haze. Grabbing groceries in the frozen food aisle. Selecting which Netflix original series to fall asleep to. These are things you do all the time, yet never give much thought to. Why is that? While such everyday activities may seem arbitrary, they grant you a title that has been held in high regard for centuries—the title of philosopher. Defined by Google’s dictionary as “the study of the fundamental nature of knowledge, reality, and existence,” the discipline of philosophy lurks as an invisible hand that guides us through our daily lives. Living means making split second decisions, both consciously and unconsciously. Your judgement, character, and ideals can all be explained philosophically, and have a much greater impact than you might think. Let’s take brushing your teeth. The best place to start would be with the toothbrush itself. What color is it? Is it manual or automatic? Are the bristles mangled or looking good as new? While you may chalk these up to personal preference, philosophy explores why these preferences exist at all. Determinism is the philosophical idea that everything is determined as a reaction to something that happened in the past, implying that humans have no free will. The toothbrush you bought at the pharmacy has nothing to do with your individual opinion, and instead is a result of an algorithm created by hundreds of thousands intrinsic decisions that you made, but have no recollection of and can’t recall even if you tried. Now let’s dissect the brushing action. Why are you doing it anyway? You probably answered “because my dentist told me,” or “because the mint flavor makes my mouth feel clean.” Sorry to say, but “because” answers are useless. Philosophy doesn’t care about what you actually say, and instead prioritizes the mental framework of why you set having clean teeth as an ultimate goal. The theory of empiricism articulates that knowledge can only come from some form of sensory experience. You’ve most likely had a blissful moment where your dentist compliments you after brushing more frequently. You’ve also probably (and unfortunately) smelled someone’s bad breath when they got a little to close, and determined that brushing consistently is the best way to avoid that happening to you. Gilbert’s ability to examine his own values instead of leaping into counter-argument mode demonstrates how philosophy helps us avoid taking things at face value. Rather than assuming a good vs. evil narrative when conflict rolls along, asking “why?” can lead to a more holistic view. He cites road rage, when we often jump to conclusions about character. Philosophy has long been a mainstay in higher-level education and will remain so because it is relevant. We are decision-making organisms at our core, and why we make decisions will forever be fascinating talking-points. Rationale and reason lie sneakily along our path during every waking moment of the day, invisible puppeteers. So while you mindlessly brush your teeth tonight for the billionth time, just remember that every decision, interaction, observation, and explanation, has led up to that. exact moment. Felipe Silveira is a third-year student at UC Santa Barbara, majoring in Global Studies and minoring in Professional Writing. He wrote this for the Writing for Web and Social Media course in the Division of Humanities and Fine Arts.